Bahia Principe, the leading all-inclusive resort brand with properties in Spain, Mexico and the Caribbean, has officially opened its 25th hotel, a five-star Fantasia-brand resort in the island of Tenerife, Spain. 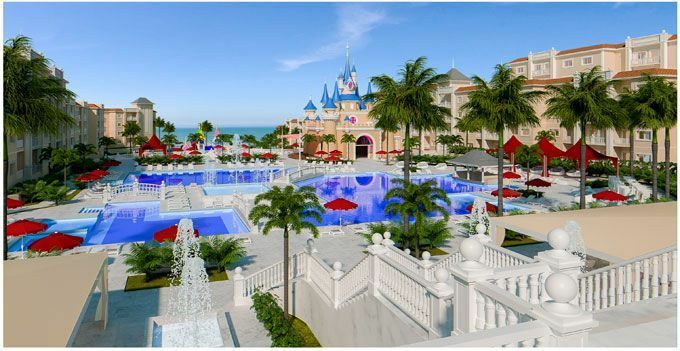 Fantasia Bahia Principe Tenerife in San Miguel de Abona represents a US$90 million investment that will position the brand as the benchmark in high-end family vacation tourism. The brand’s first newly constructed property in Spain since 2003 is a sprawling complex that features eight buildings spread throughout more than 480,000 square-feet of space. The resort offers 372 rooms, seven swimming pools, five restaurants, six bars, a water park, the brand’s signature Bahia Spa, and wellness center, among others. The most striking structures are the property’s beautiful white castle and replica “Dragon Tree,” known as the Drago Milenario de Icod de los Vinos, a dracaena tree that is an icon of Tenerife – both which are located by the pool area in the center of the hotel and will feature spectacular light shows at night. Fantasia Bahia Principe Tenerife is Bahia Principe’s first Fantasia-brand property in Spain, debuting nearly two years after the debut of Fantasia Bahia Principe Punta Cana. Fantasia is the brand’s family-friendly concept that offers thematic hotels and guarantees an enchanting vacation experience with the highest standards in quality and service. The other Bahia Principe brands are Sunlight, for the remaining hotels in Spain, Luxury and Grand. In addition to reinforcing Tenerife’s hotel offer, the new property will generate 300 jobs on the island, 30 percent of which will be directed toward people who were previously unemployed and registered with the Canary employment service, following an agreement between the company and HECANSA (Hotel Schools of the Canary Islands). “The creation of local employment to favor the socioeconomic development of the areas in which we operate is one of the core pillars of our business strategy, which has sustainability as a guiding thread,” added Piñero. Fantasia Bahia Principe Tenerife was inspired by the success of the brand’s newest property in the Caribbean, Fantasia Bahia Principe Punta Cana, located within the brand’s seven-hotel resort complex in the Dominican Republic. Previously known as Luxury Bahia Principe Fantasia, the 512-room hotel has completed a rebranding, receiving an updated logo and revamped, value-driving offering. Fantasia Bahia Principe Punta Cana guests have exclusive access to the hotel’s restaurants and amenities and can also access the common areas of Grand Bahia Principe properties in the complex. Like Tenerife, there is a massive fairytale castle at the center point, home to nightly shows including a video mapping story that relates to the destination, its nature, and history. With two expansive swimming pools, splash-filled waterparks, children’s clubs and a kids-only Bahia Spa where they can enjoy treatments including massages and princess manicures, Fantasia is a paradisiacal hang out for children. The teens club, known as “The LOFT”, is equipped with a gym, movie theater, dance floor with DJ, video consoles and a billiard table – making this the Caribbean’s top option for multi-generational and comprehensive family vacations.